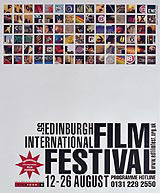 The 55th Edinburgh International Film Festival kicks off on 12 August with posters, flyers, posters, programmes and catalogues designed by Navyblue to attract new audiences. Obvious film-related imagery has been avoided, says Navyblue marketing director Mike Lynch. Instead, the promotional material reflects the ‘essence’ of the film festival through candid imagery and retrospective typography. The festival features over 100 films and runs until 26 August.